Once again it's been a long gap since our last post, so it's catch-up time. We got got back to Seattle around Jan 5th and set in to visit family, continue working on various boat projects, and actually get out for some winter Pacific Northwest (PNW) cruising. The boat remained at dock for about the first 10 days as projects continued, though we did get out for one day of sea trials to experiment with and collect data on the Simrad Radar performance. More on that later. For now we can look at some of the other projects. City water pressure can vary widely. Anywhere from 40 psi to well over 100 psi. Well, the pressure on the dock here in Seattle is way high. After blowing out a couple of hoses and a shutoff valve, I put a little cheepo pressure gauge on it and it pegged the needle. I can't remember if it was 125 or 150 psi, but it's no wonder it was blowing out hoses. So project #1 was to put together a portable pressure reducer. It's a household pressure reducer valve made by Honeywell, and it's adjustable which is handy. Other than that, it was just a matter of gathering up the right fittings at the hardware store and putting it all together. 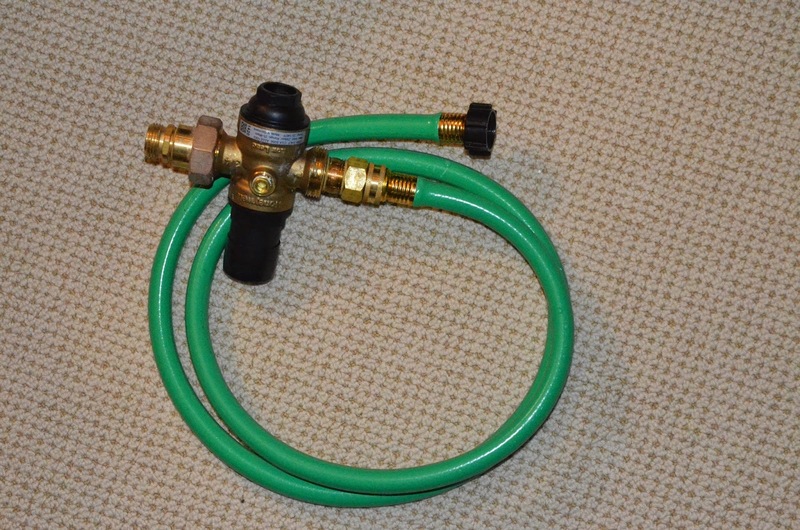 There is a short section of hose that attaches to the dock hose bib. Originally I just connected the reducer assembly to the hose bib, but it was pretty big and gave a really long lever arm against the faucet and pipe if you pulled too hard on the hose. I was worried about breaking the dock-side water, so added the 6' section of hose. Now the reducer just lies on the dock, and you can wrap the hose around the dock pedestal for some strain relief if desired. I think I set it to 60 psi, but don't remember. But it works great. It's enough pressure to wash the boat, but low enough that I can fill the water tank without having the hose rocket out of the deck fill. And no more broken hoses. Speaking of water pressure, we had another little adjustment that needed to be made. 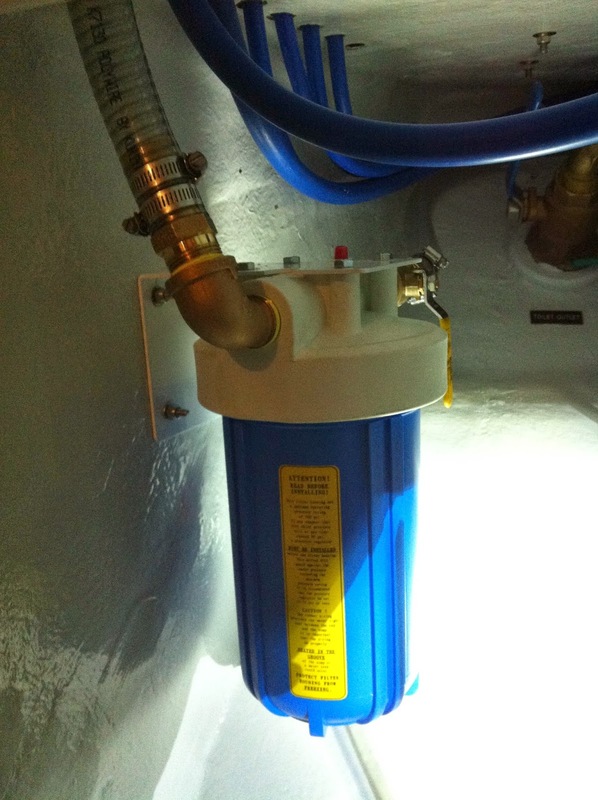 The boat's main water supply includes one of these pressure reducing valves too. 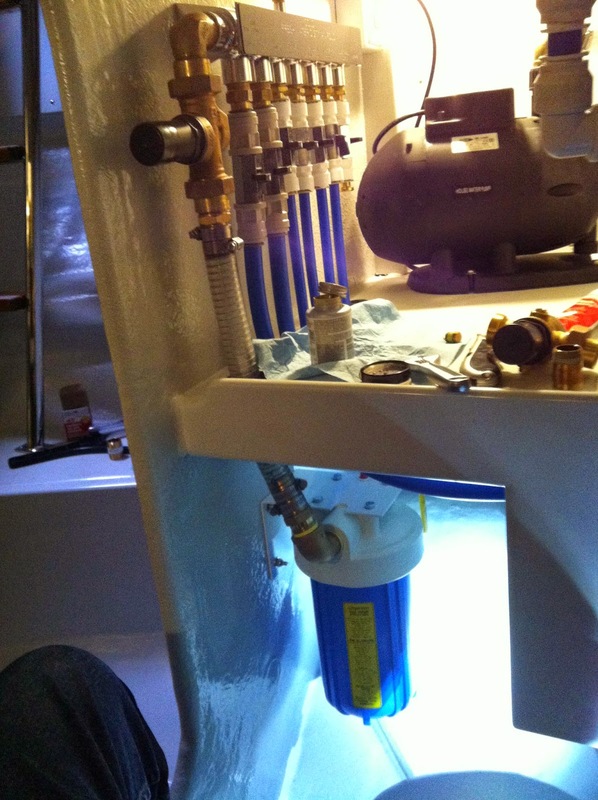 The house water pump and tank operate between about 50-65 psi. At the outlet of the tank and just before the distribution manifold, one of these reducers is installed to maintain the house water pressure at 40 PSI or so. The problem we ran into right away was with the toilets. They fill by way of a nozzle of some sort, and we found that they were causing back splash out of the bowl, misting the surrounding area or your bottom, depending on what was closest. Our solution was to just turn down the house pressure until there was no back splash. It worked fine, except now there wasn't enough pressure to run any hoses on deck for cleaning. The solution was another pressure reducer dedicated to the toilets, so I came back to Seattle equipped with two of them. By installing a second reducer on the branch line that feeds the toilets, we were able to raise the house pressure back up to 45 psi or so, and reduce only the toilets down to the 20 psi or so required to prevent splashing. 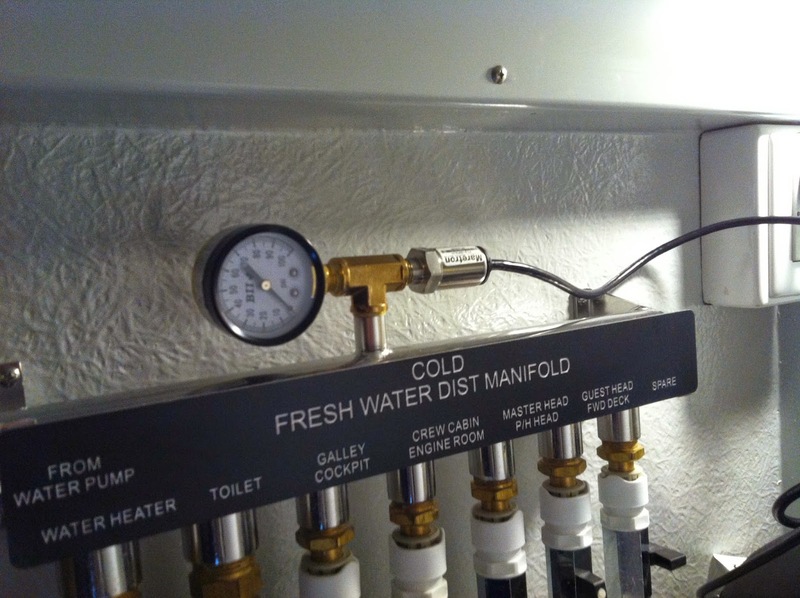 In the pictures below, you can see the main reducer on the end of the manifold, and the second reducer on the branch tap for the toilets. While I was at it, I did a few other things too. There was no main shutoff valve between the tank and manifold. So to do any work on the manifold required draining the tank completely. I also wanted to add a filter housing to I can use a charcoal filter as needed depending on water quality. With the tank drained, it was the perfect time to add both. Here you can see the filter housing, and maybe catch a glimpse of the shutoff valve on the far side of the filter. Second was to add a pressure gauge - actually, two of them. The distribution manifold comes with a port on the top for a pressure gauge, and I found a gauge in a drawer on the boat. I'm not sure why the yard didn't install it, but I went ahead. I also wanted to add a pressure transducer for my Maretron monitoring system. If while the boat is unattended there is a drop in the water pressure, it indicates a leak and I want to know about it. 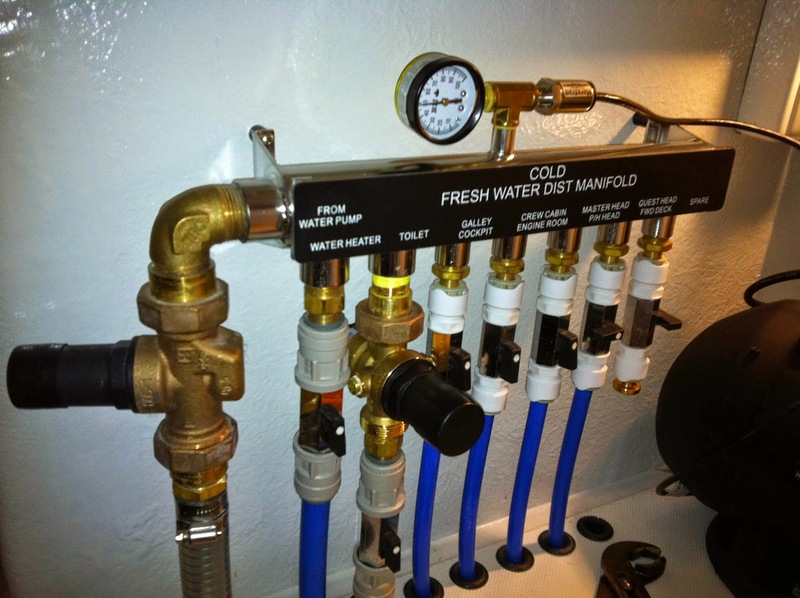 In the picture below you can see the brass Tee that I installed, along with the gauge and transducer.